The global natural source vitamin E market is driven by an increased awareness among consumers about health and intake of necessary vitamins and minerals. The growing disposable income is increasing the affordability of products and this is also propelling the demand for natural source vitamin E. Amidst the market’s struggle due to declining supplies of deodorized distillates, a key raw material used for manufacturing natural Vitamin E, the market will expand at a12.8% CAGR from 2016 to 2024, states Transparency Market Research (TMR). With sustainable demand from the wealthy or well-to-do customer base, the market is estimated to be worth US$2,251.7 mn by 2024. There are two variants of natural source vitamin E available in the market: tocopherol and tocotrienol. Of these, tocopherol is expected to lead in terms of demand as well as in terms of being the highest revenue contributor. The tocopherol segment accounted for 65% of the market back in 2015. High use in dietary supplements is a key reason for the growing demand for tocopherol. As tocotrienols are difficult to absorb during digestion and are also poorly distributed to blood cells, their demand will is low. Moreover, they are rapidly metabolized and eliminated from the body. Thus, its application is limited to cosmetics, where it is used for anti-aging creams. Therefore, tocotrienols occupies a significantly lower share as compared to tocopherol in the natural source vitamin E market. The applications for natural source vitamin E include dietary supplements, cosmetics, food and beverage, and animal feed. Of these, the dietary supplements segment not only led in the past but will also witness growth in the coming years on account of the promise supplements hold in preventing chronic diseases or of the promise of longevity. The expansion of distribution chains will also aid the demand for vitamin E-based dietary supplements such as energy drinks, tablets, and capsules. The market for natural source vitamin E is flourishing in Europe and North America. The market for natural source vitamin E market in North America was accounted for over 40% in 2015 and 26% in Europe. The growing awareness about having a healthy lifestyle and the increasing realization of the importance of nutrients by making use of supplements are both driving the natural source vitamin E market in these two regions. The presence of excellent distribution channels will also ensure the growth of the market in Europe and North America. The increasing affordability of natural source vitamin E on account of increasing disposable income in developing nations of Asia Pacific is helping the market in APAC to grow. It is estimated that during the forecast period of 2016 to 2024, the Asia Pacific natural source vitamin E market will expand at a 13.3% CAGR. 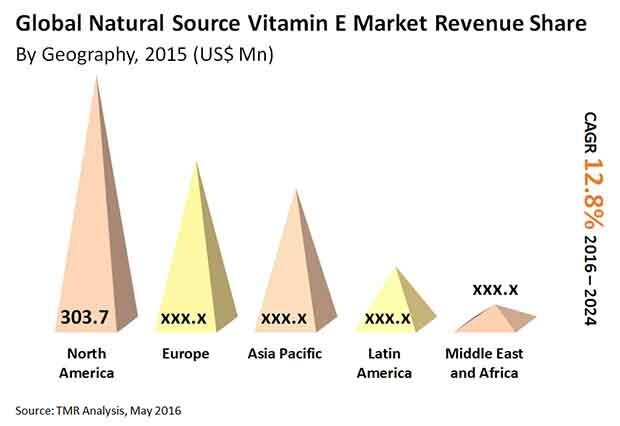 China will be a lucrative market in Asia Pacific region for natural source vitamin E.
This market research study analyzes the natural source vitamin E market on global basis and provides estimates in terms of revenue (USD Million) from 2015 to 2024. It describes the market dynamics affecting the industry and estimates their impact during forecast period. Moreover, it highlights the opportunities for the growth of the market in the next eight years. Natural source vitamin E is fat soluble antioxidant. It acts as an enzymatic activity regulator and plays an important role in neurological functions. It also protects lipids and prevents oxidation of polyunsaturated fatty acids. Increasing consumer concern regarding toxic chemical additives used in dietary supplements, food and beverages, and personal care products among others are propelling the growth of natural vitamin E worldwide. The market for natural source vitamin E is segmented into three product types: tocopherols, tocotrienols, and others. By application, the market is further subdivided into dietary supplements, food and beverages, cosmetics, and others. The market is classified into five geographic regions - North America, Europe, Asia Pacific, Middle East and Africa, and Latin America. Some of the major natural vitamin E rich foods are sunflower seeds, vegetable oils, spinach, peanuts, avocado and broccoli among others. Intake of vitamin E prevents oxidative stress, facilitates healthy muscles, and improves eyesight and immunity. Thus there is huge demand for vitamin E rich food and beverages among health conscious consumers. Foods with natural vitamin E content aid in protecting against cancer, heart disease, muscular degeneration, and kidney and liver damage among others. Natural vitamin E improves moisture content in the skin and skin texture. It also protects the skin from harmful UV rays and prevents deposit of melanin. Thus, natural vitamin E is widely used in cosmetics and skin care applications, including creams, lotions, lipsticks, and sunscreens among others. Moreover, it accelerates effects of sunscreen based ingredients and prevents skin associated disorders. It also improves the stability of lipid based cosmetics. All these factors coupled with anti-aging benefits are likely to drive the demand for natural vitamin E based cosmetics worldwide. Other application areas of the natural vitamin E market includes animal feed. Alpha-tocopherol is the major natural vitamin E active compound used in feedstuffs and as supplementary in animal diets. It acts as a biological antioxidant, maintains functional and structural integrity of cells, and improves immunity and health of animals. Moreover, these antioxidants are added to animal feedstock in order to enhance oxidative stability and increase shelf life of meat. Considering all these factors, there is significant demand for natural vitamin E in animal feed. The growth of Natural Source Vitamin E market is driven by the rising health concerns faced by individuals due to unhealthy and sedentary lifestyles. There has been an increasing need and demand for Natural Source Vitamin E, which induces healthy living and wellness among individuals. In addition, the aging population is largely dependent on vitamins and other nutrients that are natural and effective as compared to other drugs and medicines. Moreover, economic reforms coupled with growth in the overall healthcare sector and increasing private equity investments in the natural vitamins industry is set to bolster the growth of the market globally. For better understanding of the Natural Source Vitamin E market, the study includes market attractiveness analysis, where the application types are benchmarked based on their market scope, growth rate and market attractiveness. The report also offers market share analysis of the different industry participants. Major players have been profiled and their company overview, financial overview, recent developments and business strategies have been covered in the report. Key market participants profiled in the report include: DSM N.V. (Netherlands), BASF SE (Germany), Archer Daniels Midlands Company (U.S.), Wilmar Spring Fruit Nutrition Products Co. Ltd. (China), Beijing Gingko Group (China), Davos Life Science (Singapore), Eisai Food and Chemical (Japan), Fenchem Biotek (China), Riken Vitamin Co. Ltd. (Japan) and Zhejiang Worldbestve Biotechnology Co., Ltd. (China). The report provides a cross-sectional analysis of by product and of by application segment with respect to the above mentioned regions.